NOSTRADAMUS A CLAIRVOYANT OR A TIME TRAVELER? Many people believe today that Nostradamus (1503-1566) is a notorious fortune-teller or a prophet. However, the true story has not been written yet because Nostradamus was not clairvoyant but a time traveler. 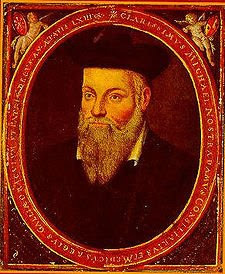 Most importantly, Nostradamus was not an official time traveler, incidentally he contacted with a real time traveler (Dominic Litio) from the year 2555. and this is the reason he had information about the future. Interlocutor:… Now moving to another issue a totally different topic, here I have an email from a person, very clever, who made an observation about Nostradamus: How is it possible that he was a time traveler, if he has a record of his time like his birthdate, his marriage and it is even known that he had offspring? Ruanel: The answer is this: There was a contact between a native of that century and a time traveler called with a Latin name, Dominic Litio. This time traveler was going through, supposedly very personal and serious problems and practically he escaped from his time, because he had numerous inconveniences, and he used Michel of Nostradamus who lived in that time, as a confessor and a "handkerchief of tears" or "Wailing Wall” to use usual expressions to you. Nostradamus had pity on him and he sheltered him in his house, he didn’t believe him though, obviously, although he had very advanced knowledge for the time, but not so much in psychology, but rather in philosophy. Nostradamus, in spite of his skepticism, felt very intrigued of his outfit, his manners, and his language. And he listened to him sincerely while the time traveler told him about his sorrows, his lost affections, and his abandonment, because he had lost a home. Interlocutor: Are we talking about lost things in "his time", that is to say, of the year 2500 from where he came? Interlocutor: But why he couldn’t return to his time? Ruanel: Because Dominic had escaped using, without authorization, an apparatus to travel through time. Interlocutor: Had he escaped from the year 2500? Ruanel: Yes, he had escaped from his time. Ruanel: He had a family and problems in his job. He was married and he had two children, but he separated from his wife in a very conflicting way. Interlocutor: Are we always speaking about the time traveler? Ruanel: Yes, the time traveler. Michel of Notredame and the time traveler are two different people. Interlocutor: It is clear. At this moment I have a question to ask .How do you know all these things? I ask it because I know that you cannot move to the year 2500. Ruanel: Because at this time I am connecting myself with the spirit of Michel of Nostradamus - I say "spirit" because he is not incarnated, otherwise I would say "Thetan”-and he is telling me what the time traveler told him. Interlocutor: Now I understand. You spoke about job problems. Ruanel: This person, Dominic Litio, was a time traveler just like Kronbus and he took to his work his marital problems and as a consequence of it he was fired. Then, in his desperation – he had engrams, he had bitterness -, he stole an apparatus using energetic keys, very common in that time of the future, and he erased from the central computer the access to the data of his place of destination, to avoid that they trace him. Then, using the traslation device, he arrived to the time in which Michel Nostradamus lived and he met him. Michel was a very receptive person and, as I already said, he took him to his house. This time traveler acted totally in an irresponsible way, because he could have caused an irreparable disaster in the previous mankind, because the time guards, when not having a way to know the point of arrival, they can’t repair the mistakes made. This is made in this way because if the error is made it is already registered in history like there was a change and they don't know where. Interlocutor: I believe that I understood the point. Was Dominic younger than Nostradamus? Ruanel: Yes, he was younger than him and when he saw him very helpless so he decided to protect him. Obviously, Dominic explained to him what was going to happen in the future - that was the past for him - and he also revealed to him many secrets, especially related to the discoveries that humanity would made. Interlocutor: To what extent Michel of Nostradamus believed to the time traveler? Ruanel: He didn't believe him. Everything that the time traveler told him, he took it with a grain of salt. Interlocutor: Did Dominic live with Michel of Nostradamus then? Ruanel: He lived with him during a long time. Interlocutor: Then he was somebody very well-known in that time. Ruanel: On the contrary, he was practically unknown because he hardly left his room. Remember that he was somebody with many conflicts. Michel prepared for him tranquilizer herbs so that he didn't suffer too much and he didn't have engramic outbursts. Interlocutor: This means that although a time traveler is in another time, it's a similar to his time? I'm referring to the physical point of view. Doesn't time travel modify the physical organism? Ruanel: No, there is no variation. There will be variation with the course of time, he will age, but this is logical. Interlocutor: And why didn't they make him return like they did with the time traveler (David Lang) since we know that he wanted to stay in a time that was not his time, and he even married and he had children? Ruanel: As I already said, because they didn't know where he had gone because he had erased from the central computer the date of destination of the time machine. Interlocutor: You are right, Master, I forgot that fact. Did Dominic choose the place of destination or it was aleatory? Ruanel: It was aleatory. He was so engramic that he escaped to anywhere. He could "have fallen" in another place and history would have been another. Anyway, much of the information that the time traveler gave to Michel of Nostradamus was mostly madness due to his mental imbalance. Interlocutor: Let’s see if I am understanding well, all that you are saying is what the spirit of Michel of Nostradamus is telling you , I mean that the time traveler told him when he was incarnated? Ruanel: Of course! The time traveler told him how he was unfairly fired, how his wife cheated on him and how they separated. Interlocutor: Summarizing, we don't know with certainty if this was truth? Ruanel: No, with certainty not. They could have been a mental derangemet of the time traveler. Ruanel: I am conceptualizing what the spirit of Michel of Nostradamusis is telling me. Everything I am telling you is past, not the future. And the half of what the time traveler told him were ravings. Interlocutor: It is perfectly clear. Are the famous "prophecies" among those ravings also? Interlocutor: Which means that the piece of nonsense about the prophecies - of some of them , not of all them -, Are in fact a fantasy of some authors who interpreted these prophecies whimsically and the ravings of the time traveler? Ruanel: Exactly. It is necessary to remark undoubtedly that some prophecies- in fact are badly called in this way- because to the time traveler these events were past and they were true. This entry was posted at Friday, May 01, 2009 and is filed under Time Travelers . You can follow any responses to this entry through the .